Emma who is an active model and artist and CM director Norihiko Suzuki which directed a lot of CM that can be seen on TV, they are friends who call each other by their first name Emma and Nori. In the first part, we heard stories about their first encounter with books and we visited old bookstores. In the second part, we will talk about the effect of books in the city. Please enjoy this time as well their choice of books and the dialogue around the city. ー Please show me the book you brought today. Emma：Yeah sure. First of all it is a special issue of “Studio Voice”. It is from the 90's, this edition introduced a photographer and his work, he was a trendy photographer at that time, that is really famous now with lot of recognition. This magazine talk about a lot of trendy topics, but the trends changed a lot since the past so it is interesting to see that change. I feel like magazine have more to give to me cause they are more influential. Another one I brought, photographer Honma Takashi's edited "Ura H Honma camera". It is a very unique, slightly funny magazine. They tried to make it a serious magazine, and I feel that this kind of magazine can’t be done easily nowadays. I also brought a manga called "Garo". I first discover that manga through my uncle, he had it on his bookshelf, I thought at that time that the manga was pretty indecent so I read it in secret (laugh). This is what I used and bought in the secondhand bookstore, but "Kamui Den" by Mr. Shirado Sanpei and Shigeru Mizuki's "Kitaro" were on board. One of the interesting aspects of manga magazines is that manga artists struggle to make their series more popular than the other mangaka’s one. I also love “Shonen Jump”, and when "Naruto" and "One Piece" were serialized at the same time, I felt that the two writers have created a certain era while working hard, and just thinking about it I am still excited! Nori-san：I also like manga magazines. I often forget about books I read when I was a child, but when I looked at something in a manga magazine or when I turn around an old book store in Jimbocho, I sometimes see a book and thought that it was a book I was reading a while ago, often memories that I have forgotten come back to the surface. I think that it is the merit of visiting old book stores. Until I came to Jimbocho, I moved around once every two years. 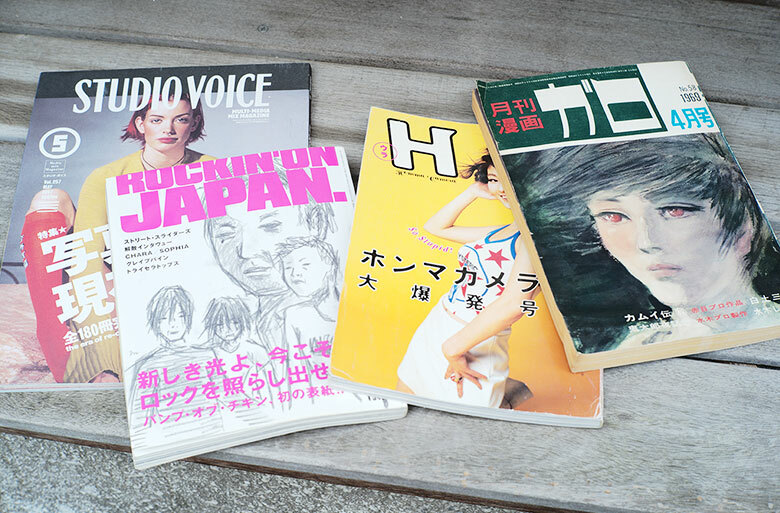 As we had to disposed of books each time, Jimbocho is a place full of memories, we always have one or two cherished memories we forgot about until we came to Jimbocho and remember them again. Nori-san：Yes. I have disregarded them myself, but I feel relieved when I think that they are still here somewhere in Jimbocho. ー That is a good story. If you think so, the city of Jimbocho may be like that, but the city itself may have a role like an external hard disk of memory for many people. When you visit there you can meet yourself in the past, or you can find a new thing that you don’t know about the past. I've heard that Jimbocho has escaped a major air raid during the Second World War so it had that role as a memory device of the city. Nori-san, can you introduce your book? Nori-san：Yes. The first book is a book called "European scooter travel book" that I bought in Jimbocho around 10 years ago. It was also interesting to read a book written in the 1950s, and you can also see pictures of European street scenes taken at that time. It seems to have been written as a scooter maker documentary, but I also ride a motorcycle and the landscape comes as a road movie everytime I turn the pages. Also I like movies and I collect a lot of books about movies. Emma：My mother is the same age as Nori-san, and my mother's bookshelf have many similar books. She is also a movie lover. Nori-san： In the 1980's, many good road movies came out at movie theaters and it was an era when it was possible to see it on a big screen, not a small monitor of a PC. So I was able to see it as if I had gone to America's wilderness and European rural town. There are also cinemas in Roppongi and Shibuya, where they schedule such movies from time to time, but they are now gone. A book written about a movie that has less opportunity to be seen in a movie theater, I will definitely buy it. I also like animal books and I am buying them for work patterns. Emma：The secondhand book has a fixed price sticker on the back and the prices they are sell at now changed a lot. This animal's book is very expensive (laugh). Nori-san：Well yes (laugh), I like the photos of Shimpei Asai and I bought the same thing even if I already have it. Emma：Yes the one on "Sunday Morning". I have seen pictures of the waves taken by Mr. Asai before and I've thought that it is awesome. Nori-san：Recently he is also active as a television program commentators etc, but I like the old black and white work very much. The picture of the ordinary citizen's holiday photographed in Guam is very good. 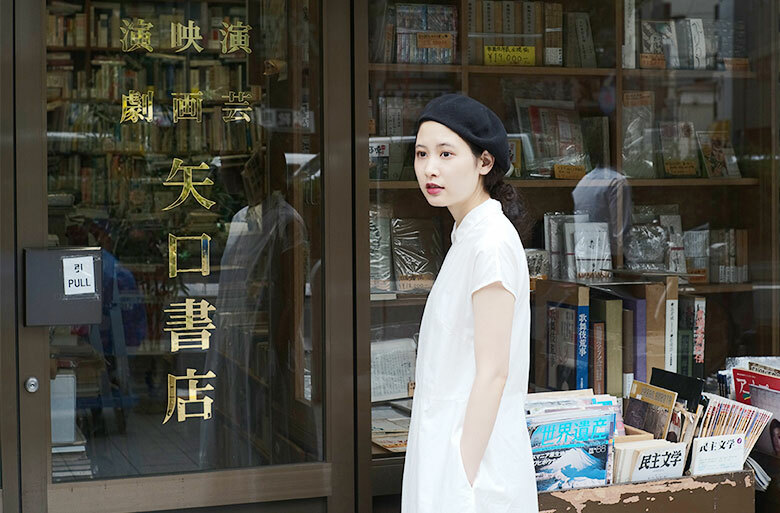 ー Do you often go to Jimbocho’s bookstores to buy books? Nori-san：Yes. While living in this town, I often go out to Jimbocho to buy them. ー Emma, what do you think when you take a look at Nori's book collection? Emma：Everything was cute. The one that I brought is not that cute (laugh). I started to be really interested with the black and white photographs by Shinpei Asai. When I was a high school student, I was attracted by the feeling that it is somewhat cold, although it is warm though, there is something somehow in communication with Yoko Takahashi's photo collection. ー Emma you also take pictures, but do you see that book from the perspective of a photographer as well? Emma：When you take a picture, there are times when you come across an image you saw somewhere before. Even when coordinating clothes with the work of a model, it is common for images that you saw before in a book to come up to you suddenly. ー Certainly there are many things you get from books. Emma：I think this is so true. How much am I affected by various parts of what I am watching/seeing. ー Is there any influence from books in your work Nori-san? 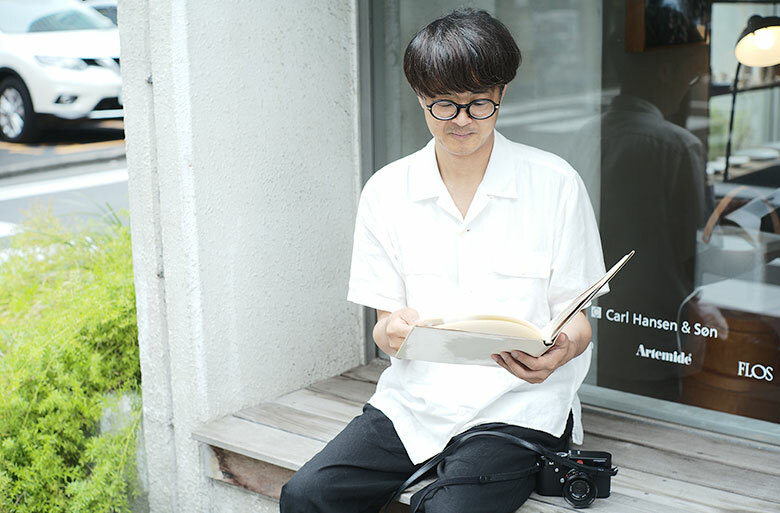 Nori-san：Although the picture is a moving picture, the basic is close to a still photograph. So I think that the designers also use photos and visuals that are likely to be a reference for their work, but the book I mostly buy are for work references, so I tend to buy a lot. 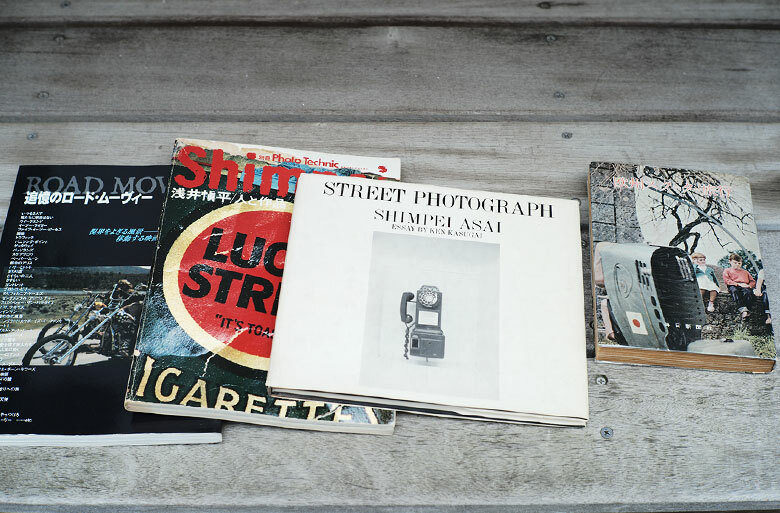 Emma：When I also make something, I will see a lot of art books and photo albums. Even when writing sentences, I will have books of respected writers on my desk. ー When did you start to work in that industry? Nori-san：Although I liked books, I liked watching movies everyday on TV since I was in elementary school and I also liked the cartoons that was being shown in the evening. So I think that I saw more fascinating video works in junior high school and high school and that also influenced me. I began to think that I wanted to do work related to the image in the future by myself, and so I entered that industry. ー Emma you’re currently acting as an artist and model, but what do you want to do in the future? Emma：Now If I could find an office that understands my activities, which happened to be a model/artist. I didn’t find a place like that yet. But I think that it’s fine now. Originally I love talking, I entered this world from the desire to tell people something. From now on I want to be able to put out more of such places. Also, I want to show where I am moving, talking. ー This is fun! Today's theme was "book" and "walk", but do you like walking? 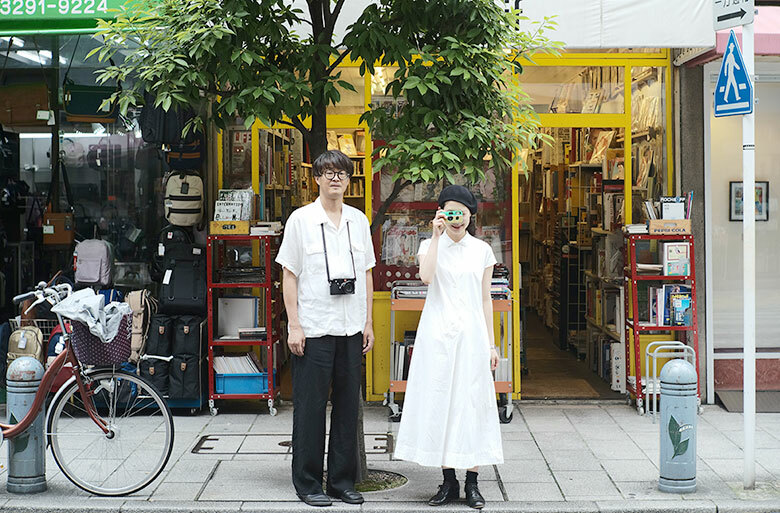 Nori-san：As it is today, I often take a walk with a camera. Walking is a small "road movie", isn’t it? Tokyo is a town where the change is particularly severe, so I think that the speed at which I walk to discover new shops is just right. In this neighborhood, there are many of my favorite old book shops and coffee shops with a good atmosphere, and a modern and futuristic feel in Akihabara and places where Showa landscape is spreading somewhere if you extend your legs towards Kanda I also like that. I think that this area is a very enjoyable city to go for a walk. Emma：I also like walking and I walk about 10,000 steps a day. I have this habit of thinking a lot, and I can imagined a lot of things while walking (laugh). I usually carry a camera around, so I will take photos while taking a walk. ー We had a lot of fun and enjoyed talking about everyone’s book and about their work. Thank you and let’s meet another time for another walk ! Born in Kanagawa in 1992. Graduated from Tokyo Zokei University. She is drawing attention with her talent in different fields like modeling, essay writing, photography, painting, recitation, narration... In 2012 and 2014 she hold a solo exhibition of fine art works. Now she is represented by a fashion agency. Lives in Kanda Nishiki-cho, Chiyoda Ward. Graduated from Osaka University of the Arts. 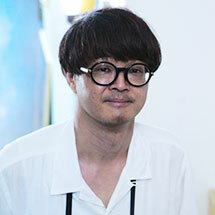 "Ichikawa office" associate, worked at San Ad Inc., freelance CM director. TV CM, PV, Web movies and others, photo exhibition and publication of ZINE and photo books. Dad of Mitsuba the cat's and Bukku the dog.